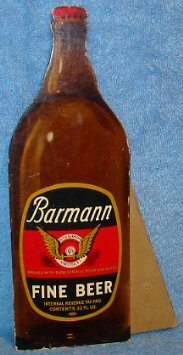 Barmann Fine Beer; 10 1/2 inch high cardboard diecut bottle with easel stand. Great IRTP 32 oz. label. Barmann closed in 1939 and advertising is scarce from this brewery. Slight wear mainly around the very edges. No creases. Darkish area near the neck in the photo is just bad photography. The small white spots are part of the graphics. Some very slight bubbling along left edge and bottom.